Playtime is fun yet serious at the same time. Once you’re totally immersed, anything can happen. Flying on the wings of their imagination, two girls and a boy embark on a standoff: because when there are three of you, who plays with whom? From among the rolling eggs, the shuffling old woman and the flying cow, a game of friendship, loneliness and solidarity emerges. 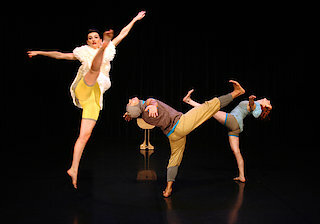 Flying Cow is a reworking of the internationally successful show Speelvogels [MADCAP].